Mutts Canine Cantina offers treats for both us and our fur buddies. If you’ve ever wanted to take your dog out to dinner, schnauzer chance. Velton Hayworth. Mutts Canine Cantina, 5317 Clearfork Main St, FW. 817-377-0151. Dog Park: 6am-10pm daily, rain or shine. 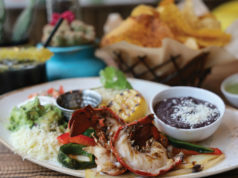 Restaurant & bar: 9am-8pm Sun, 3-8pm Mon-Thu, 12-8pm Fri, 9am-8pm Sat. Closed during inclement weather: temperature below 40 degrees, rain, or when the chance of rain is 40 percent or more. All major credit cards accepted. I woke up my wiener dog Lenny from his third nap of the morning, and we rolled to Mutts Canine Cantina. The dog park was poppin’ on the sunny, warm Saturday. It was also barking, slobbering, and generally acting a fool. Dogs of every size cavorted on the mulch-covered ground, from drooling Great Danes to the tiniest tyke in the joint — which just so happened to be mine. Designed for people who love dogs as much as they love to drink, Mutts offers booze and food in a dog park setting. Its bright yellow picnic tables and umbrellas practically jump off the corner at Clearfork like a labradoodle lunging for a liver treat. Mutts expanded to Fort Worth last fall. Its original innovative beer garden/dog park concept launched in 2013 in Uptown Dallas. Mutts’ dog park is divided into a small dog section for little wusses (Lenny) and a much larger area for real dogs. White plastic chairs and tree-trunk cocktail tables create a comfortable lounge space for the pup’s human companions. In classic wiener dog fashion, Lenny cowered under my chair as he barked threats of unimaginable violence at the big dogs on the other side of the fence. They stared back in googly eyed confusion. Unlike every dog park I’ve ever been to, Mutts charges admission. 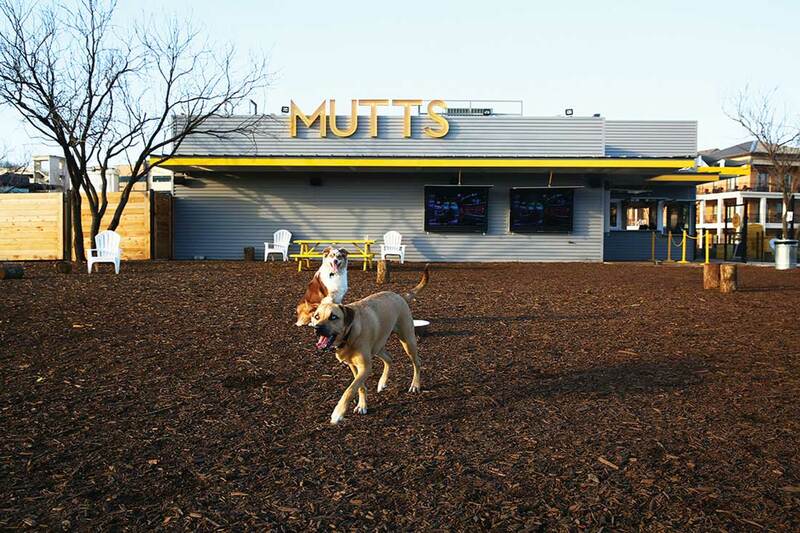 But also unlike every dog park I’ve been to, Mutts has a full-service bar. Thirsty humans can walk up to the window and order another round without having to leash up and leave. The bar’s highly potent Barkaritas provided a mouth-puckering citrus slurp of fresh lemon and limejuices. 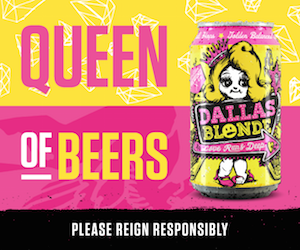 Rahr’s Blonde, Wild Acre’s Happy Fill IPA, and HopFusion Feisty Blonde poured from the tap. Non-imbibers can try craft sodas, pressed juice, and fresh lemonade. Hungry humans must decamp the dog park for the lively patio, where leashed canines are welcome and wiggling. Counter service backed up around lunchtime but subsided quickly, handled well by the chipper staff. Three snacks, five sandwiches, and breakfast tacos (on weekends only) make up the short menu, plus a couple of treats for dogs. Lenny hesitated upon the delivery of his doggie dog, a sliced-up beef wiener (heh) with organic peanut butter. A passing lab took advantage of the situation and gobbled down the delicacy for himself, along with half of the paper tray that it came on. Lenny didn’t make the same mistake with his pupsicle, a frozen chunk of organic beef broth and peanut butter on a grain-free dog treat handle. He licked the icy treat maniacally until it disappeared and then cuddled up with the paper tray and closed his eyes. Every bar should be serving Mutts’ salt-and-vinegar popcorn, an addictive box of thirst-inducing deliciousness. The fried pickles were fried pickles, and the crinkle-cut fries were crinkle-cut fries. Both arrived hot from the fryer, which is really all anyone can ask. 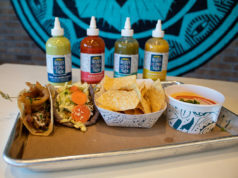 Because of the cantina’s concession stand vibe, my culinary expectations were low — and then exceeded. Mutts’ buttery inside-out buns were the best part of the day, with crispy surfaces that stayed that way instead of soaking up the sandwich’s juice. The buns added something special to the fried chicken and grilled chicken sandwiches, both simple but satisfying with good ol’ American cheese. Tangy yellow Mutts sauce was sopped across every sandwich. Officially, it’s a secret Szechuan-peppercorn sauce, but mustard definitely dominates its unique flavor, which leans sour over sweet and spicy. The hot pickles-and-cheese sandwich proved an oddly comforting combo which should be on the dream menu of third-graders everywhere. 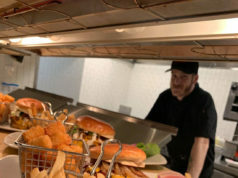 The buns spun back around the standard way on the bacon cheeseburger, a freshly grilled patty, plus pickles, more American cheese, and another appearance of the yellow sauce. Green salsa and a fresh tortilla lent personality to the breakfast taco, a crunchy combo of egg, cheese, and crinkle-cut fries. Sadly, I could not try the pecan praline bourbon shake or any milkshakes because Mutts’ soft serve machine was out of service. My wiener dog, however, was ecstatic — we could finally leave this godforsaken inferno of loud music and shaggy, wild-eyed beasts and return to the realm of humans where he belonged. Note: The other dogs at Mutts seemed to be having the times of their lives.